Construction has started on the four new point-to-point speed cameras that will operate on South Australia’s highways in 2015.
the 16.6 kilometres between Virginia and Gawler on the Northern Expressway. These sections of road were identified as high-risk locations based on the traffic volume and crash history. Over 40,000 vehicles travel on them daily and there were 34 fatalities and 168 serious injuries between 2009 and 2013. The speed that a vehicle is travelling, regardless of whether or not speed itself caused the accident, has the greatest impact on the severity of the crash. The cameras help deter people from speeding and reduce the risk of a serious accident. The cameras will be extensively tested and their locations will be appropriately marked with both 'safety camera ahead' and 'average speed camera zone' signs once operational. 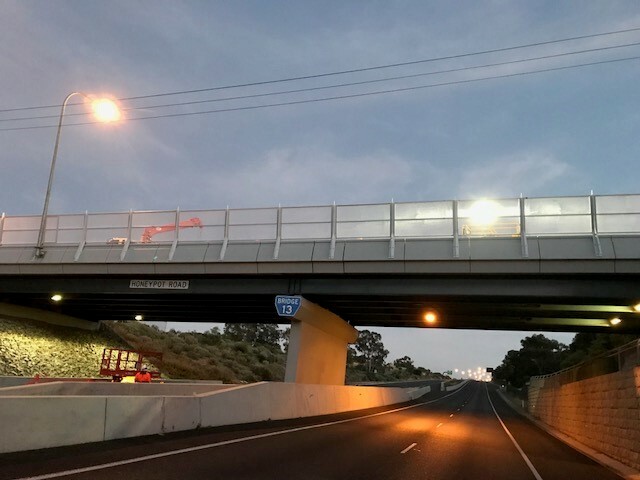 Major construction is near completion for Victor Harbor Road with the Sturt Highway scheduled to commence later this month and the remaining two sites to follow. The final camera installation and testing phases will start in late 2014 and it is expected that all four sites will be operational in 2015. Point-to-point cameras are positioned along a length of road and calculate a driver’s average speed between the two points. If the average speed of the vehicle is in excess of the speed limit the driver has committed a speeding offence. They also operate as normal speed cameras. Average speed cameras on the Dukes Highway and Port Wakefield Road went operational in July. In the first month the cameras recorded 279 at-point or average-speed offences as well as 28 evade offences. For further details see Average speed safety cameras and New point to point speed cameras explained.